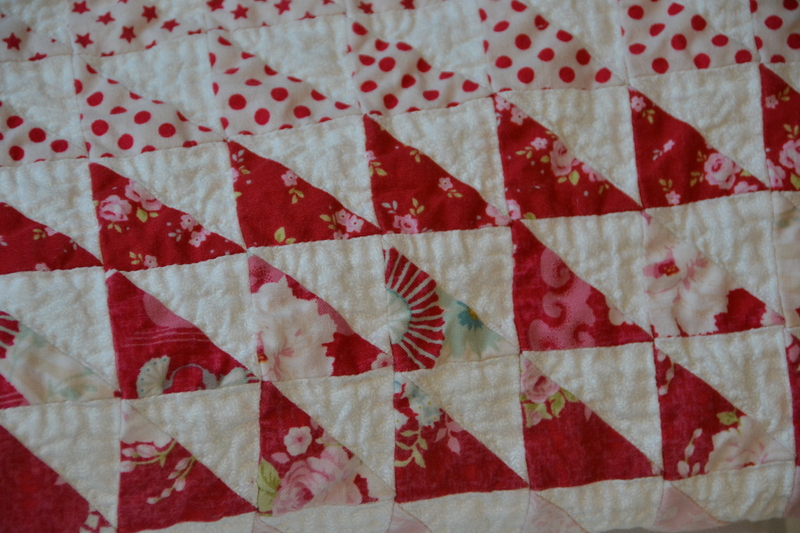 Well it has been many many months, but I am finally able to reveal what I am calling my ‘Red Currant Quilt’. I finished it January 2nd but have been waiting until we got some nice weather for a photo shoot. Eventually, I was forced to give in and just take it in the garden by our pond. 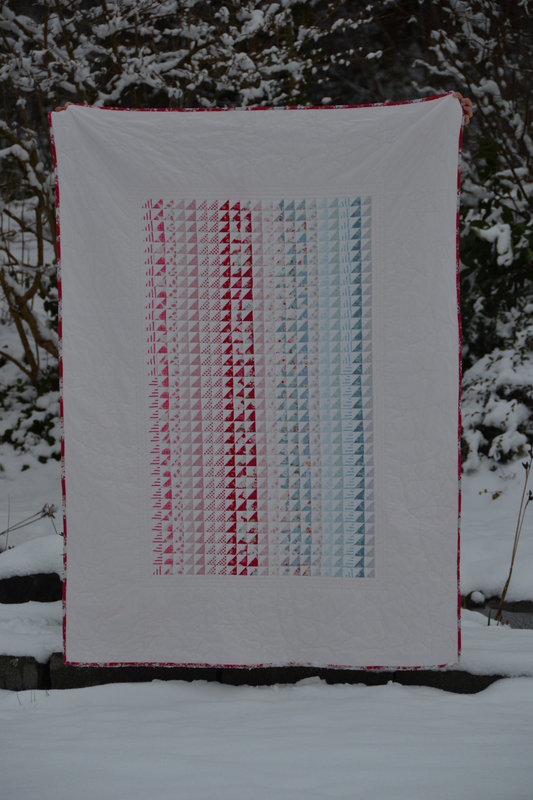 When I started this quilt, using two Tilda “Christmas Play” , charm packs, I couldn’t decide on a pattern to use so I just winged it, using many many, very small, half square triangles. After quilting they measure about 1 1/2 inches. I can tell you it will be a long time before I attempt a quilt with such small pieces, they were very fiddly and were constantly getting eaten by my machine. (Has anyone else ever had this problem?) 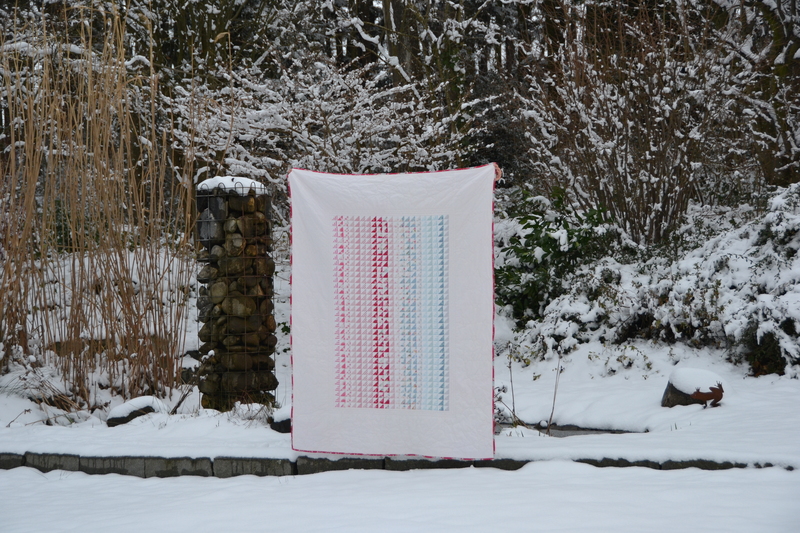 The quilt itself is 69 by 51 inches. 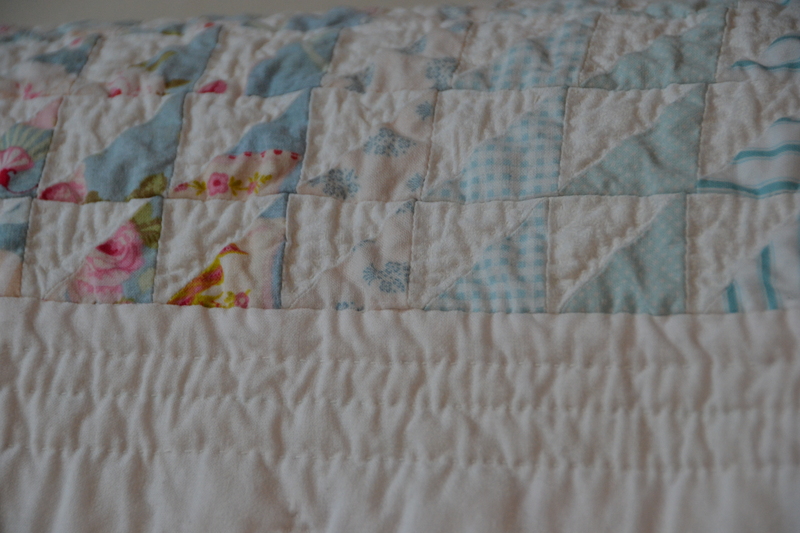 My favorite part of the process of making this quilt was hand quilting it. It took a long time, but it brought me so much pleasure. I simply outlined each white triangle. In the white border I made a frame made up of three lines. I absolutely adore the blue fabrics! 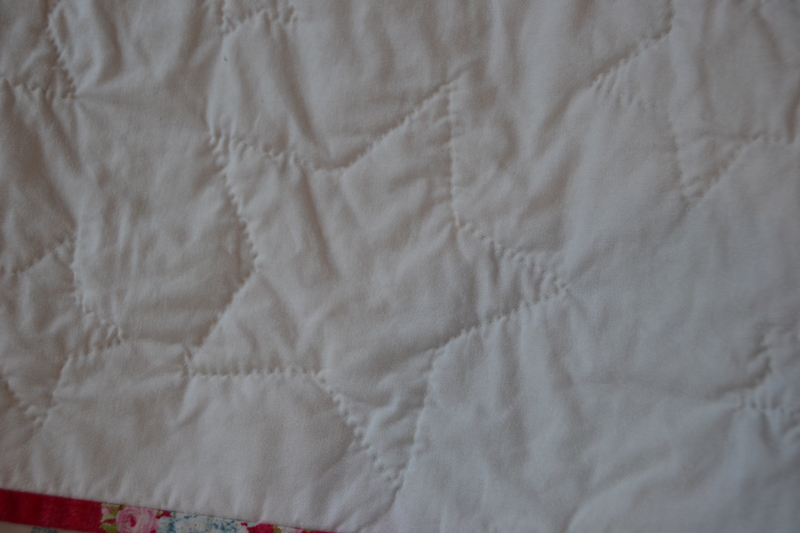 Using a stencil I made, I quilted various sized stars in the border. They are pretty difficult to see. 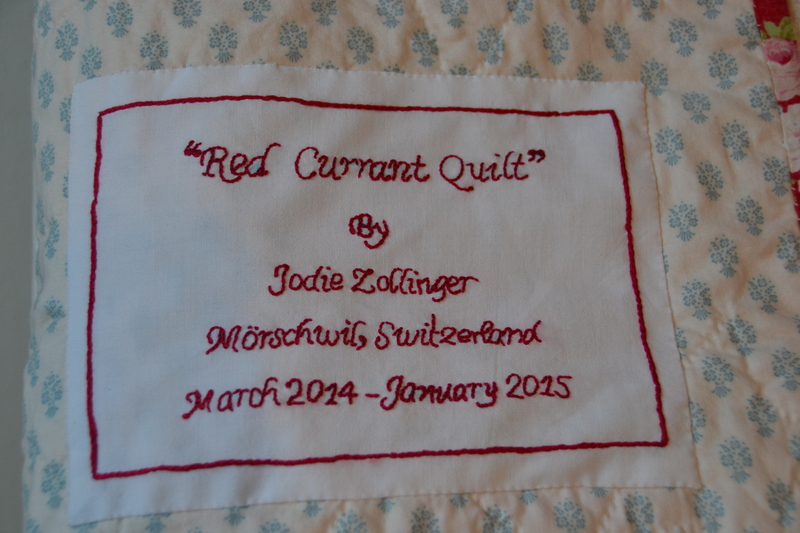 In case you are wondering I chose to name this quilt my “Red Currant Quilt” because last summer when I was working on it, this red fabric reminded me so much of the red currants I was busy picking in my garden, to make various cakes. 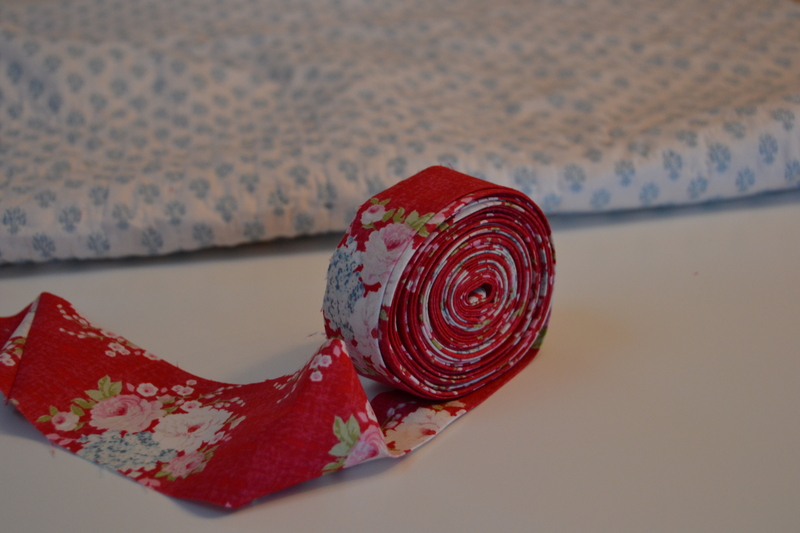 I chose this lovely floral fabric for the binding. Unfortunately, when I washed my quilt this lovely red fabric ran. 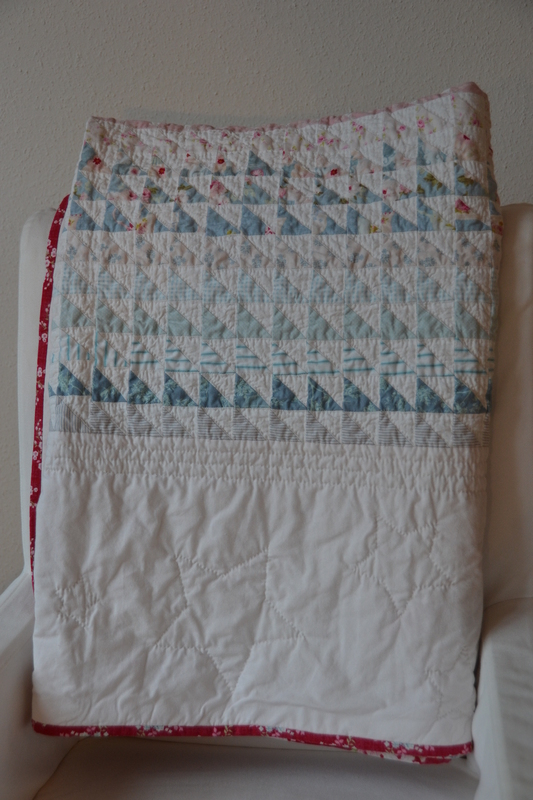 For some reason it only ran into the border, as that was a different fabric than the half-square triangles. But what was I to do, I used pre-cuts and color catchers? To finish off the quilt, I embroidered this quilt tag to the back, using the back stitch for the lettering and the back-slip stitch for the frame. This is the first quilt I have made for myself and as it is hand quilted, I must say I am a little worried I will mess it up. But I made it to be used, so here it goes! It looks gorgeous, Jodie! Congratulations! Ther are sooooo many hst! That must have driven you mad. (I use a leader fabric to stop them getting eaten by the machine – just a scrap of fabric that you put through the machine until its just at the end, then feed through you hst, or whatever). Revel in the joy of using it! Thanks Meredithe! I think I did end up trying that leader fabric thing. It is good to know that I am not the only one with these problems. Thanks Lynne! I really appreciate it! Merci beaucoup Meamifleur!! Je comprendre!